Don't think about why you're applying. Select a topic for entirely strategic reasons. Choose the coolest supervisor. Write only to deadlines. Expect people to hold your hand. Become "that" student. When it comes to a masters or PhD program, most graduate students don't deliberately set out to fail. Yet, of the nearly 500,000 people who start a graduate program each year, up to half will never complete their degree. Books abound on acing the admissions process, but there is little on what to do once the acceptance letter arrives. Veteran graduate directors Kevin D. Haggerty and Aaron Doyle have set out to demystify the world of advanced education. Taking a wry, frank approach, they explain the common mistakes that can trip up a new graduate student and lay out practical advice about how to avoid the pitfalls. Along the way they relate stories from their decades of mentorship and even share some slip-ups from their own grad experiences. The litany of foul-ups is organized by theme and covers the grad school experience from beginning to end: selecting the university and program, interacting with advisors and fellow students, balancing personal and scholarly lives, navigating a thesis, and creating a life after academia. Although the tone is engagingly tongue-in-cheek, the lessons are crucial to anyone attending or contemplating grad school. 57 Ways to Screw Up in Grad School allows you to learn from others' mistakes rather than making them yourself. Graduate school is a high-stakes venture when you consider the time and cost invested in return for relatively meager job prospects. 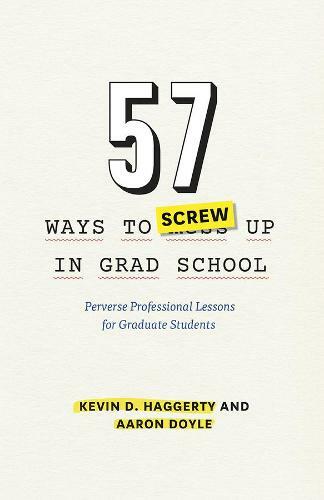 57 Ways to Screw Up in Grad School provides useful advice to make a student s time in grad school as productive and rewarding as possible. --C. Ray Chandler, professor, Georgia Southern University and author of The Chicago Guide to Landing a Job in Academic Biology"